I came across this image today and was annoyed by the incorrect use of ‘your’! I did try to be gracious and look past the poor grammar, and actually see the message but random the capital letters and poor grammar was too much. And a message like this needs all the additional credibility it can get really – not everyone will accept the concept of vibrations and auras impacting your life and finances, and even if you do believe in those things, there are so many quacks in those fields it is hard to trust a new source of these ideas. The image above (ie not my corrected version) came from Money Habits where they were questioning the wisdom of the message and encouraging people to pay attention to their financial concerns in order to find solutions. I don’t know the original source of the quote so can’t say if it went on to explain their meaning or give ideas on how to improve their vibration – without additional content, this quote is fairly pointless as it doesn’t give guidance to someone. If you send out a message to engage people about their concern, you have to follow it up with some information or a means to get answers. Just stating the problem isn’t helping anyone. Last week my father-in-law died. A red rose is beautiful and simple – nothing more is needed to be said. So it’s been a hard week and I haven’t posted in the meantime. I also haven’t listened to all the Problogger sessions thus haven’t shared any more ideas nor implemented any myself. But it has made me think about choices of words and the hidden context of words we sometimes need to be aware of when we communicate to people. Especially to people we may not know well so may not know what context they will use to understand our words. The day Tony died, we went to the nursing home he had been in. A lovely staff member spoke to us and would only refer to Tony passing. She was obviously very uncomfortable with saying someone had died. Conversely, other people I spoke to during the week commiserated and mentioned people they had lost in the past. While most of us would understand what someone means with ‘ we lost my father-in-law last week’, it doesn’t feel right to me. At least in part because it reminds me of a comedian routine giving responses such as ‘was he labelled so someone could return him’ and ‘that was careless of you’. Having written many things for superannuation funds, I have had to write about death (that is, explain their life insurance policies). And again it is interesting how different people react to this topic. In my usual less-is-generally-best style, I write ‘if you die’. Various fund staff wanted words like ‘in the event of your death’ because it seemed softer or less ‘in your face’. A few years ago, I interviewed Robyn O’Connell for an article. As well as having written a book on death for children (which I made use of with my children leading up to the funeral), Robyn is a celebrant and has done a lot of work around bereavement. Robyn was strongly of the belief that saying die/dead is better than any euphemism because it is clear (which appeals to me!) and makes it easier to accept the reality to aid the grieving process. It’s not just about the obvious meaning. We need to choose words that give the right meaning without the incorrect hidden message or the wrong emotional reaction. What thoughts and feeling do you have to die compared to passed away compared to lost or any other euphemism you know? Someone calling a rose by another name puts the wrong images into our minds. Of course, if a rose actually had a different name it may be perceived differently – who knows! I wish I had taken a photo of the roses we had on the coffin on Monday. They were beautiful and would have suited this post perfectly. But I didn’t think of taking photos during a funeral and wasn’t really in that emotional place anyway. Interestingly, someone did take photos at the funeral – perhaps not at the church but certainly at the cemetery and wake. I was surprised to see him doing so but not offended by it. How would you feel about someone taking photos in an unexpected setting such as a funeral? It has been a tough week. And this is where I indulge in something more personal in the form of a mini tribute to a lovely man. Tony was a gentle man, a very generous man who gave a lot. For one thing, he was president of the E W Tipping Foundation for 21 years. Intelligent and respectful, Tony was a man of few words. A loving father and grandfather, Tony will be missed by many. The number at his funeral showed that, too. Enthusiastic sponsor mentions generate interest for the sponsors and the supported organisation. I’ve been watching it happen. I’m sure you’ve seen lists of sponsors before, whether it is for a conference, a charity event or a local club or group. Listing sponsors is fine, but how often do you really take notice of many of the sponsors in such a list? Recently, I have seen some gratitude to sponsors that stood out – and made me truly notice the sponsors. Ok, I haven’t actually used those sponsors since then but I have a higher opinion of them now than before! The Heartkids 24 hour bike-a-thon is basically promoted via a Facebook page. Whenever a new sponsor joins in, an enthusiastic, heart-felt (sorry, no pun intended) update is added to the page to thank the sponsor. Occasionally, other mentions of the sponsor are made as an update, too. The Heartkids charity bike marathon – a good cause and a good business example. And as a shameless plug, the bike marathon would love more sponsors or donations if you feel inclined. I’ll be doing a small part of the bike riding, but the more support generated for Heartkids, the better. For the Heartkids bike marathon, this is not a marketing ploy – there is genuine gratitude and excitement behind those status updates. If you have real enthusiasm, how can you show it in your business? If you don’t have real enthusiasm, it will probably show through so what can you be enthusiastic and passionate about to gain that interest? Put the enthusiasm and passion in – someone like me can always tweak the words to read well – and people will instinctively been drawn to what you are saying. On my way to Canberra yesterday, I listened to the flight attendant’s safety message. Obviously we are meant to do this every time we catch a plane but it isn’t the most interesting speech you’ll ever hear so it is, uh, challenging to stay focussed on it. We know you can operate a seat belt, but we want to give you a few tips on using ours today. It was a bit more human to acknowledge most people are smart enough to use a plane’s seat belt so it felt friendly and more interesting than ‘here’s how to do your seat belt up’. However, just the fact that it was different to the usual safety blurb got my attention. And kept me listening to see what other changes they’d made to their message. Unfortunately, that was the only deviation from the normal approach. It certainly wasn’t like Air New Zealand’s safety video! Nor is it now standard at Qantas. My return flight used a video to present the safety message and it was routine. And I didn’t really pay any attention to it. When’s the last time you listened to a flight safety message? When’s the last time you consciously changed something in your business to keep it fresh and attracting attention? What does April Fool communicate? Did you see Virgin’s glass floored planes announcement on Monday? In short, they joined the April Fools Day spirit and announced a plane that would allow you to watch the passing ground as you flew. Spectacular views maybe, scary probably! A number of other companies also ran some jokes on the day, and it got me thinking about the message behind such jokes. Running a public joke like that can obviously be taken a number of ways, but I think most people appreciate it as long as it remains appropriate. Making a joke shows the company can be fun and don’t take themselves too seriously. It may make it seem more approachable and flexible, too. It could send a message of being too frivolous or flippant, but I think that comes back to keeping the joke appropriate – to the business brand as well as generally appropriate for the public. Is it a good business tool? if it’s well done, people will share the story so the business gets lots of publicity. How many Facebook and Twitter mentions did you see of company April Fools jokes this week? Of course, these benefits need to be weighed against the cost of running such a joke. It may not cost a lot of money to Photoshop an image or put a message on a website, but there is a cost in time to plan a joke so it works and goes live at the right time. Speaking of timing, remember that April Fools jokes should only be run before midday on 1 April. That can get tricky with a global audience such as on social media. So what do you think – do you enjoy such jokes? How does it impact on your view of the business behind the joke? So often business has an image of steady, conservative and boring. And often we present our messages in that way because it’s expected, always been that way and we just don’t think about doing anything different. Yet there is no reason we can’t add some creativity to how we present our messages. It make take a little more thought and care to be creative with serious messages and conservative brands, but look beyond the obvious sometimes and add some life to your business materials. Safety messages where you must tell people some rules and expectations is one area many would assume has to be done seriously and without much humour or interest. But isn’t it better to add some interest to ensure people actually take note of the message? The perfect example is the safety message given before every commercial flight takes off – you know, this is how to do up your seat belt, your life jacket is here and please attach your own face mask before helping others. It is important and we should all listen to it. But once you’ve been on a few flights, it gets somewhat repetitive and we tend to tune out during the spiel. My last few flights with Qantas have included videos with topical sportspeople talking and demonstrating how to do things – Olympians during winter and cricketers more recently. That’s a bit more interesting, especially for sports fans. And I have seen one flight attendant ham it up so everyone near by watched him for amusement – and thus he got his message across. Air New Zealand, from the land where Lord of the Rings and The Hobbit movies have been created, has improved the lot. Their latest safety video is given by people dressed as for Middle Earth, with Gandalf as the pilot, Gollum finding the path of lights and a cloaked Bilbo (well, he was invisible so I’m guessing it was Bilbo!) reading the safety chart. It gave all the necessary information, in fact it went into more detail than others I’ve seen, and entertained as well. It probably even works as a promotional tool for the movie and New Zealand tourism. A perfect example of how we can be more creative when giving even boring and routine information. Can you think of other creative examples of boring messages? 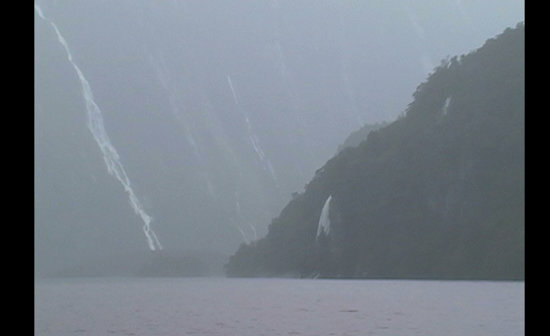 Is this New Zealand or Middle Earth? PS Air New Zealand has an incredible variety of ticket types and a different way of bracing in an accident – in Australia, we’re told to grasp our ankles where they are told to put hands behind their head and elbows beside their knees. I wonder if there’s any significant difference between the two in terms of comfort and protection. Every story has (at least) two sides. As a writer, you can choose which side you are going to tell, or focus on – and that choice can have consequences. A business can focus on the message ‘our product has these great features’ and sell a few products. Or that business could focus on ‘our product can help you these ways’ and make more sales. Yesterday, tens of thousands of people gathered together in Melbourne in memory of Jill Meagher, and for a better world. For over a week, many people have discussed Jill’s disappearance and the discovery of her body – in blogs, tweets, Facebook updates, and more, as well as in mainstream media. People are upset at what’s happened. What happened was awful and the person responsible must be stopped. Jill and her family deserve that, and respect and sympathy. As do all the other people, and their families, who have been raped and murdered. We have a choice as a society – a choice of what to focus on and a choice of how to act. We can protect our women, children and elderly. Or we can work at creating a safer environment where they don’t have to be protected (at least not from other people). Do we add more police, more security cameras and stop the vulnerable walking alone? Or we do teach our children to respect and never hurt others, that violence isn’t a good way of life, to “use their words”? A month or so ago, the gun debate heated up again in the USA. I was really pleased at that time to read how our anti-gun laws and the buy back scheme in 1996 have made a difference – the reduced guns in our country had a positive impact. I don’t want to teach my daughters to be scared and never go places alone out of fear. I prefer to teach children (my own and those I interact with) care and respect, along with anti-violent messages. If we focus on protecting women, what are we teaching our daughters? What are we teaching that group of men who don’t respect women, and who think hurting women is okay? 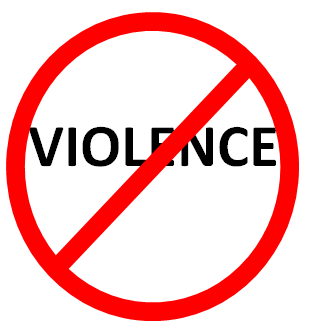 If we focus on a ‘we won’t accept violence’ message, how will that impact on our daughters? What will that teach our sons? Which side of the story will you choose? Reviewing my newsletter from July 2010, I was reminded of the importance of getting your terminology right when writing – thanks to an example of poor writing from someone who considers herself to be a guru. As a business, you have a message to get across to people which hopefully will lead to some action which helps your business. A clear message will be more effective at engaging and inspiring action than a confusing message. If someone doesn’t understand the message, they will give up and probably think little of your business. If someone misunderstands your message, you will waste time fixing misconceptions and possibly having to pay the price to rectify things. Other than through dumb luck, it is next to impossible to give a clear message if you use terms you don’t understand yourself. So how do you react when someone confuses a message through poor word usage? Are you willing to spend time trying to figure out what a confusing message actually means, or do you give up and go elsewhere? Scroll down and let us know what you think! I spent the weekend camping with 50 Scouts (from 6-year-old Joeys to 17-year-old Venturers). We had a lot of fun, completed many activities and came home exhausted! With such a diverse age range, not to mention the range of personalities and other abilities, it could be challenging to keep them all involved and engaged. Making the weekend work was a good example of adjusting your communications to suit the audience. As leaders, we could have said lets learn how to cook in a fire and use a compass. Instead, fitting with our Harry Potter theme, we created choc-orange cauldrons and searched for the Philosophers Stone. When a little more time was needed to prepare something, I could have asked the kids to wait patiently or run across the oval to burn energy. Instead I said “Sarah and Wil, see if you can run across to the tower and back before anyone can catch you”. They all ran off, had fun and didn’t notice the delay for preparation. The best example, however, was putting the Scouts into groups for the weekend. Any other time, we might just read out a list of names and leave it at that. This time, each scout was called up to greet the sorting hat and have it decide on their group. Yes it took longer but there were no complaints nor restless kids as they loved the process. HOW we presented the activities and our messages was important in making the weekend a success – the WHAT was important too but would have been less effective on its own. A Harry Potter theme and changing ordinary activities into those with exciting names won’t help in most business situations. But the concept of adjusting a message to suit the situation is perfect for anyone, including businesses and websites. You have a key message you want people to hear, so you may as well present your message in a way that maximises how many people will listen to it. Of course, to tailor your message effectively, you need to understand your audience. On camp, we knew we were talking to active 6 to 17 year-olds who wanted to have fun and be involved. Our techniques wouldn’t have worked so well if we’d had 50 4-year-olds or a group of business men on a team building exercise. So how well do you know the target audience for your business? Well enough to adjust your message to suit? Well enough to tailor your message for different segments of your audience (e.g. those on Twitter compared to those attending a workshop)? Quality content is more than the message – it also has to be presented in a way that is easy for people to read and understand. Many people will tell you that the message is more important than spelling or grammar – and it is, but only to a point. A great message is lost if the spelling and grammar are poor. Last night, I saw a page on a website that shows how important spelling can be – as even one wrong letter can make a big difference. We make real-estate CD’s. [Business] can also make and host your web site, with promotion as the key fucus. Using a u instead of an o is not just a typo we can ignore – the new word is too close to another word and that is what now catches our attention – not the original message. It also changed the reader’s interpretation of the ‘presenting in a unique way’ in the following sentence, creating giggles instead of interest in their professional services. It comes back to proofreading your work – not just a quick glance or use of a spell check, but a genuine check of what you have written. And the best proof reading is done a day or so after the writing or by another person. The quality of your content will improve through this simple process and maintaining a ‘focus’.